The first time I visited New York, my friend introduced me to Cafe Habana. I immediately loved everything I tasted and only wished that there was one where I live. 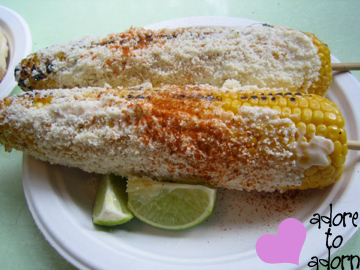 It has been a few years since and I still think about the corn on the cob I had. It's nothing new, but to me it was such a treat. I have since found many recipes for it, but finally settled on this recipe. The weather has been sunny and mild so I'm going to take advantage and enjoy some corn on the cob. No, it's not corn season and it will still be several months away, but my cravings outweigh my senses.